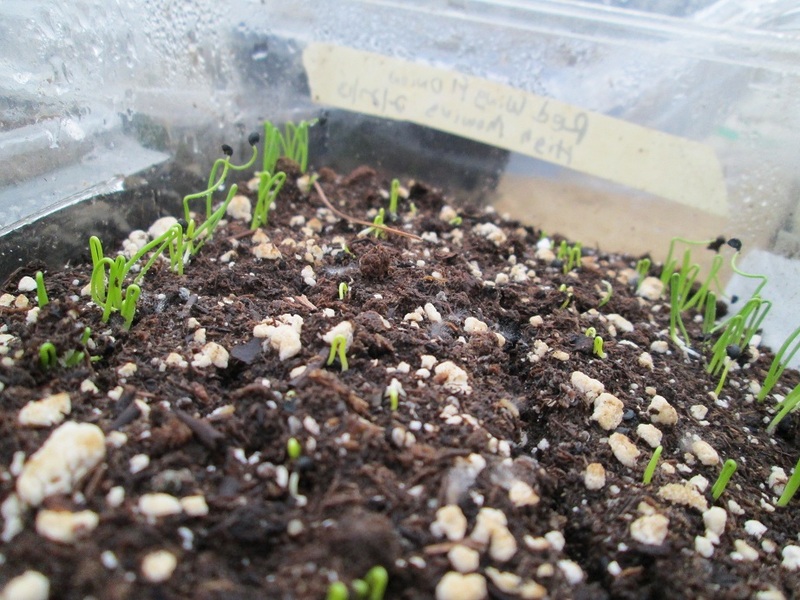 Germination! Tractor Equipment! Fooling the World! Because you demanded it: More pictures of the awesome Strider. Oh, finished painting the greenhouse, too. At night Strider and I put on our headlamps (yep, he’s got one, too – even had one before I did), and we mosey out to the toolshed and greenhouse to tuck in the seedlings, fill up the newly-purchased kerosene heater and cross our fingers that nothing burns down, explodes or short-circuits during the night. 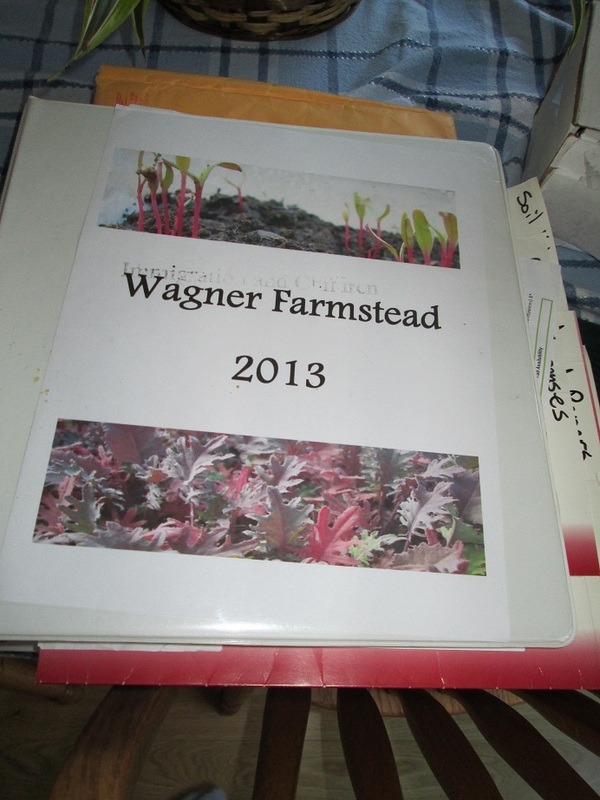 Besides worrying about my seedlings – to the point that I am making purely positive and orchestral-heavy Spotify playlists to listen to in there with them – the farm planning since the last post has included a ton of paperwork. I finally finished my Greenmarket application! But I’m waiting on a couple insurance questions before I fire it off to NYC. It was a big project – certainly the biggest paperwork project I’ve had since my job at Child Advocates – and it was quite satisfying to finish. Some of the details have really propelled my own organizing. Having to list every variety, required row feet, estimated plants and yields and planting and availability dates really made me write everything out. I spent a lot of time cross referencing the Johnny’s seed catalog, Keith’s book and the full size wild animals calendar I carry around with me everywhere (and believe me, folks at doctor’s appointments find this strange and amusing). I’ve been keeping track of everything in this big binder, including all my expenses and receipts, all my Growing for Market newsletter and legal paperwork. My extension agent, Tianna DuPont, came out to the property to meet us and see the land so she could write a third-party verification letter for the application and so she can help us more specifically as we move into planting and harvesting. 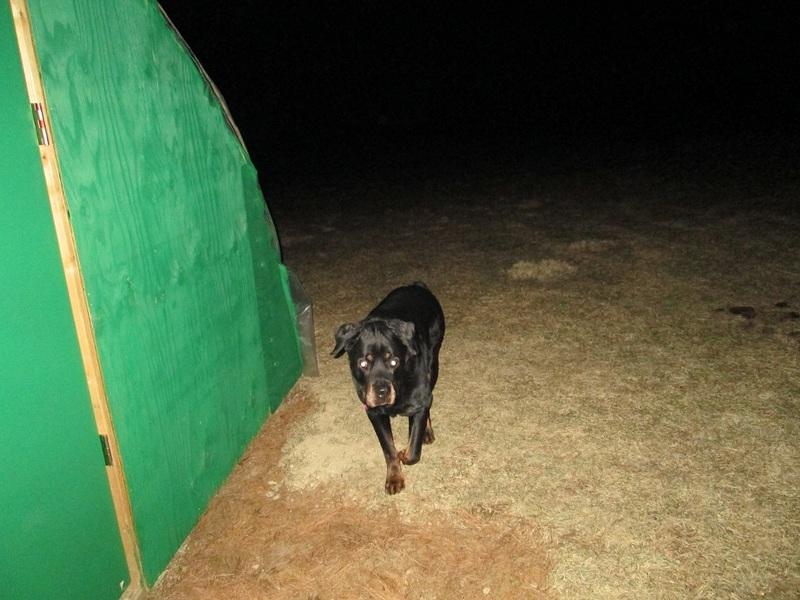 She suggested adding phosphorous to the beds as we go along, and was overall one of the coolest women I’ve ever met. I’m stoked to work with her more, and I am signing up for her Organic Vegetable Production class (provided there are still openings as of this post). My mom took her Small Farm Dream class last year while I was at Keith’s and was very happy with it. 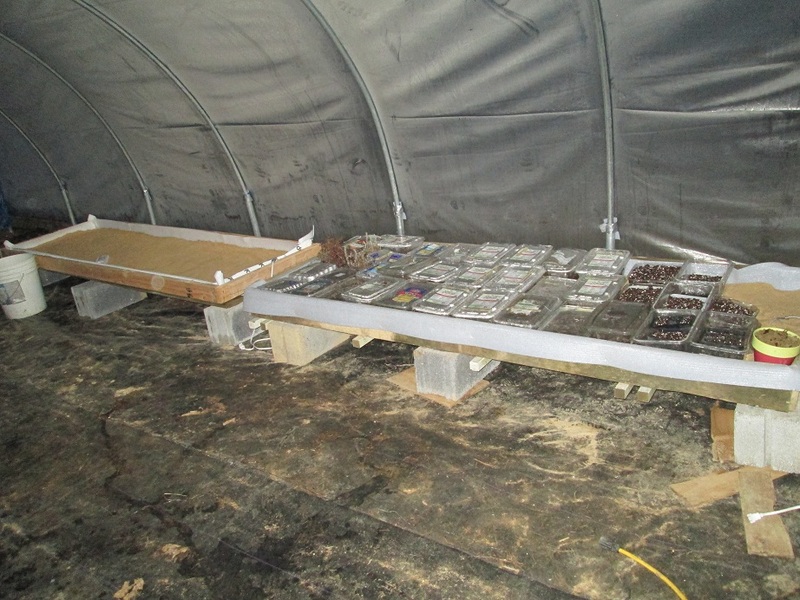 I have two of these contraptions currently set up in the greenhouse – one full of onions and one recently filled with kales, lettuce, raab, arugula, herbs and more! 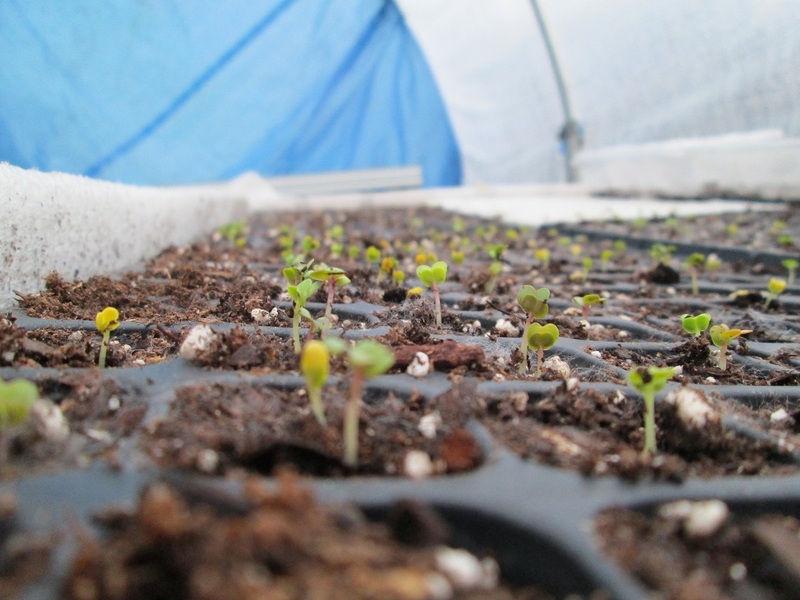 And a few days ago, we woke up to hundreds of seedlings – onions, lettuces, kales, arugula, broccoli raab and other brassicas are showing their little clover-like seedling faces. Baby basil just popped up yesterday, along with the first traces of thyme, tarragon and little hints of rosemary from seed (which I was skeptical about even working in the first place). They live! They live! 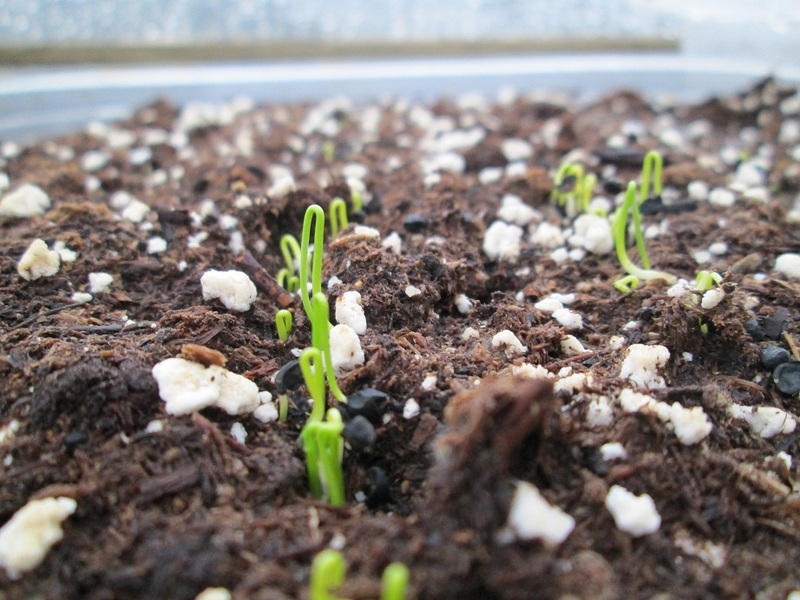 The cutest little onion seedlings you ever did see. This was my favorite part of Keith’s farm and has always been one of my favorite parts of gardening since forever. Especially after a few panicked days where I was convinced that I had killed everything, seeing these little guys made me realize that even though it will still be challenging (like regulating air temperature and airflow in an imperfect greenhouse without self-regulating equipment), it is possible. So many onions. Get ready to cook. 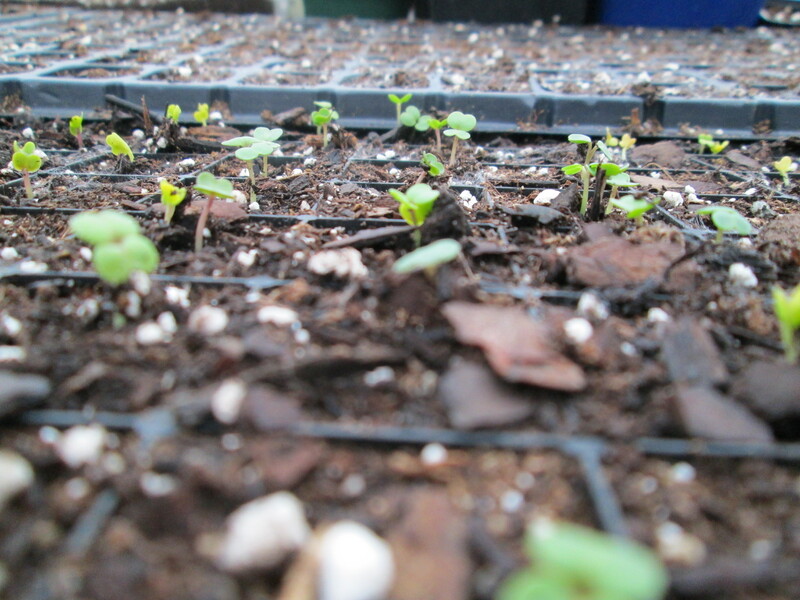 Plus, seedlings just look so darn cute. I could not be a prouder mother. And after countless hours researching equipment websites, craigslist, visiting scattered places around the state and being generally flummoxed about finding, transporting and dealing with the challenges of obtaining used farm equipment, everything harmonized and Glenn and I found a chisel plow and disc up the street from the farm. An old acquaintance of his runs used car lots and has recently moved into antique tools and tractors, and had these two pieces fresh from an auction. So these two pieces are living happily up at the property. 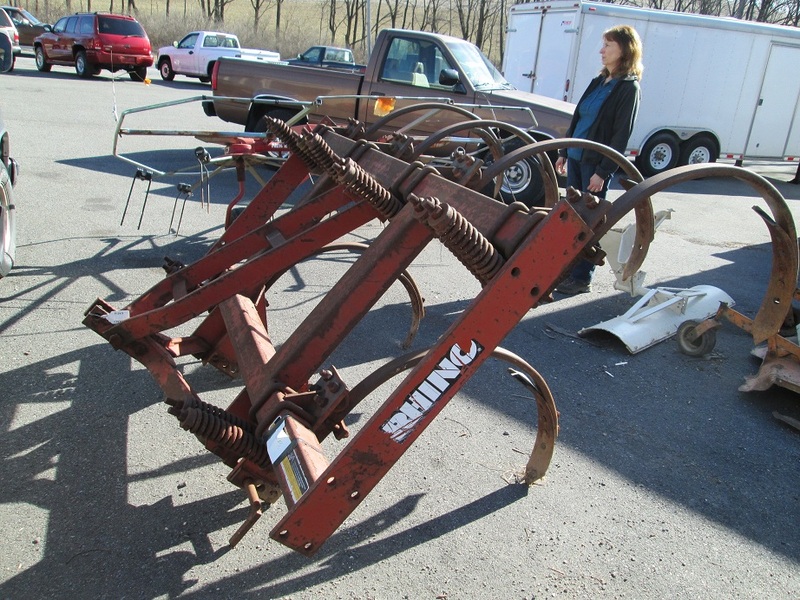 Glenn will have to use his big Case IH to do this plowing – the chisel plow (above) is used for primary tilling, so he’ll drive that through the areas I’ll plant first to break up ground and knock down the clover growing there. After a week, he’ll come through the same areas with the disc for secondary tillage, knocking down remaining organic matter, cutting up the soil and evening it to make an even, smoother seedbed. The idea here is that he’ll do these tasks in bigger sections (leaving clover in the pathways so we don’t need to seed anything else there at Tianna’s brilliant suggestion), and I will go through with the International 274 once it’s equipped with cultivators and use it as a sort of tertiary tillage before we plant into it. And then, of course, use it for cultivating and weeding between the rows of plants. The problem I’m facing is find some of the missing parts for this little, old tractor. 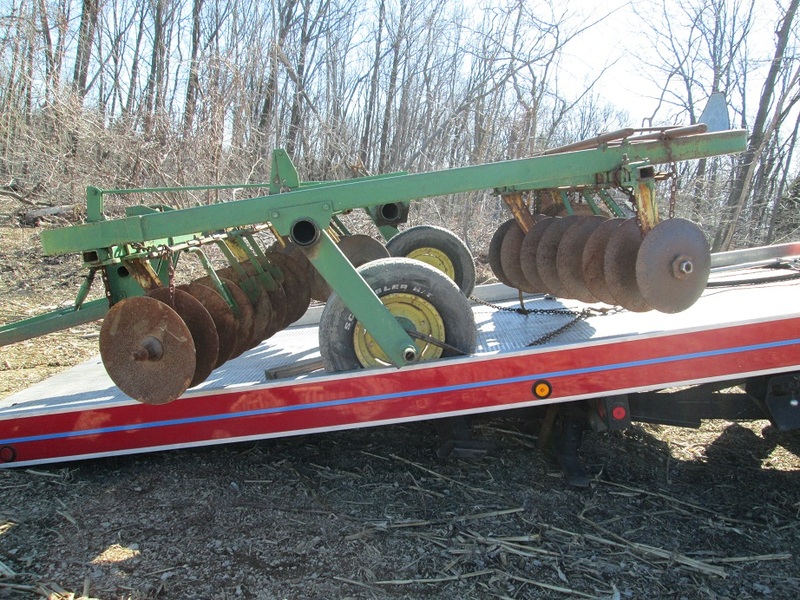 I found a site that sells the sweeps and shanks I need for cultivators, but I am missing part of the toolbar to attach said sweeps and shanks on one side of the tractor. So this is my current daunting project. Things are chugging along over here. Daylight savings has really knocked me back as I really like waking up in the sun, but the night haven’t been too cold, I have a heater and a fan set up in the greenhouse to try to prevent mold, and I’m reading, scheduling and organizing. Soon I’ll be seeding some plants to sell as potted plants in plant-able Jiffy Pots, and this week I have promised myself to create a CSA layout to share with interested parties. So keep me in the loop if you think you’d like to get in on that. In the Lehigh Valley and in Philly, I’m starting to fool people into believing I know what I’m doing (though the experienced folks still know better). I’ve been taking notes when other folks are explaining their processes to me. I can talk a little more confidently about what I’m planting when and how. I realized that, no matter what, I can always do everything by hand if necessary. Last weekend I was in buying a wheelbarrow tire at the hardware store and a man mistook me as an employee and I asked where the pruners were because I looked like I knew what I was doing. These are silly, inconsequential things, but for someone who is scared and unsure of what’s ahead, it give me the boost I need to keep moving. Keep your fingers crossed for sun! Myth Busters proved that plants grow bigger when they listen to heavy metal. And that’s about the extent of my farming knowledge that I can pass on to you!